You Did NOT Forget About the Bump, Did You? I hope you didn't. Especially because I have brought along another version of my KRumors XP script that seems to start playing well with some Kuests XP core components already. By the way, I chose to increase the width available for places' and rumors' names since one of them was a bit large indeed. Oh yeah, now the demo also includes a Kuests XP parser as well. Bump! Bump! Bump! You Got Caught by the Camera! Social Media Will Kill You For Sure! Yeah, I have updated KRumors XP once again, guys! I know, but this time it was not because of some Maracuyá that I did... I think. It has reached the 1.1.0 milestone. This new version includes two fixes, but the most important one would be the rumor list refreshing method. 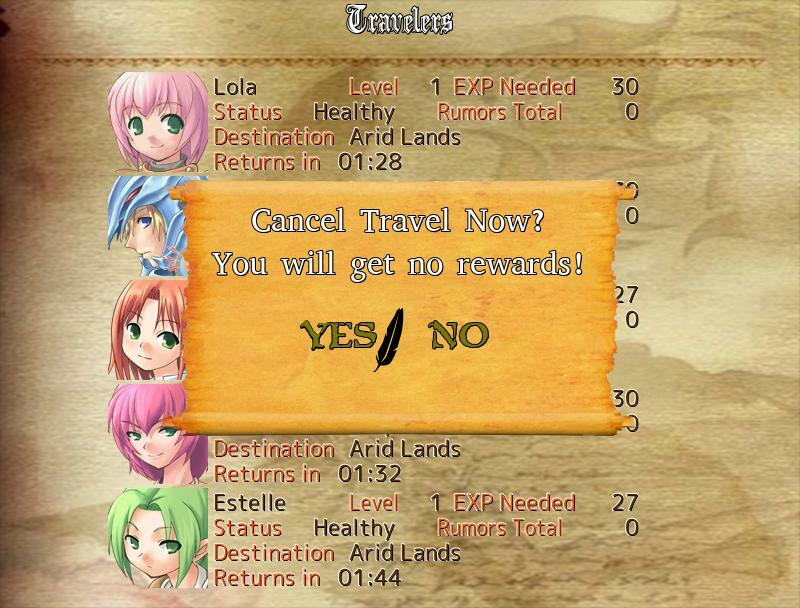 Now it does show the correct name of the rumor the hero has heard about in his or her travel. The other one is so silly that I will not dare to mention it here. Besides it also features more Kuests related stuff than before, even if it is still inaccessible for now. The Bumping Paparazzi Might Have a Mission to Accomplish! As you read it above, KRumors XP was slightly modified this time to prevent an error from showing up. It would have happened due to the number of changes I have made to the Kuests XP mini version I have included in the demo. Now you are able to open ye old Kuests XP Main Menu! Even so you will not be capable of doing anything but moving the cursor and exiting the scene as usual. I had to update the Icons, Pictures and Titles directories because of a few recent pictures I have included there to support my scripts. Happy and Bumpy Game Testing!? Maracuyá Made a Last Minute Call to Force the Bump to Go Home! Yeah, it is sad to admit that the bump had to return to its unknown base due to some nosy Maracuyá asking for a script call to force a hero to stop gathering rumors and strange stories. It reminds me of O'Neill furiously asking Doctor Jackson to stop studying an captivating but ancient or primitive culture for the mission's or the team's sake. Thus KRumors XP was updated once again! By the way, my fellow gamers or developers, I have updated Kuests XP mini version as well. Now you can actually watch how the many menu works and even look for the names and level difficulty of quests you have not accepted, yet. I think it is quite early as to say you can get all of the information you would want to learn before accepting a mission. Yeah, instructions are now available in English and Spanish. Feel free to take a look at this screenshot concerning the previous update. An Insignificant But Permanently Changing Bump! As you might have eventually noticed by now, this reply handles the arrival of a new KRumors XP update. This time I had to change it because of HiddenChest's latest update but also because of minor changes in Kuests and KRumors XP. What did you say? Minor Changes? What kind of changes are they? Err, let us just say they had to do with including stuff like a background sprite covering the KRumors menu while you are in the read rumor stage. Plus the scroll backdrop got modified as to make it look darker than before. I hope these changes will make it easy to read the contents. I would also like to get some feedback from the scripting impaired concerning how easy you think you can edit the TXT files aka templates and navigate the KRumors menu. Beware of the Buggy monster that might eat your legs if you are caught unprepared to fight him back! Or was it "Happy Game Testing!"? You better tell me! OK, I know that is a crazy heading, but it serves a purpose... To let you know KRumors XP has reached the 1.1.4 milestone already! It features the removal of useless lines of code that were no longer needed and the addition of the KRumors.repeatable flag to let you activate or deactivate the repeatable status of all rumors. If they are not repeatable, they get permanently removed. It was obvious, was it not? As a sidenote I want to tell you I have started developing a VX ACE version of my script as well. The thing is that I do not want to make it the Ace's way of crafting scripts if possible to keep it simple to support it in near or distant the future. I mean... Happy Game Testing! OK, OK, nobody likes paparazzi. Even so this time you got to make an exception and admit that you might need one, especially if you are using RMVX Ace as your current game engine. Yeah, I have published KRumors ACE not long ago. I could have done it last week or so but I had to include some modifications to let you use it even if you prefer its default window dimensions (544*416 px). Since it was crafted while keeping HiddenChest in mind, it also supports other resolutions like 640*480 and 800*608. Don't forget to fetch the krumorsace and krumorsaceparse Ruby files instead of their XP versions!